The 2018 U.S. Soccer Annual General Meeting will forever be remembered by soccer supporters nationwide for its fierce Presidential Election. There has not been a campaign in the history of the U.S. Soccer Federation (U.S.S.F.) that has had eight Presidential candidates vying for leadership. We at Vistacom couldn’t be more thrilled that the U.S.S.F. chose our electronic voting system for this historic election. Marking the beginnings of great change, this year’s election was the first contested election in twenty years. For the first time in history a five-member Fan Council was formed. Giving fans a stake in electing this year’s President, the importance of volunteers and fans to the Federation was officially recognized. After three rounds of voting, Carlos Cordeiro was elected as the 32nd President of the U.S. Soccer Federation. Vistacom’s wireless audience response keypads were used to conduct each election ballot in real-time with automated transparency. 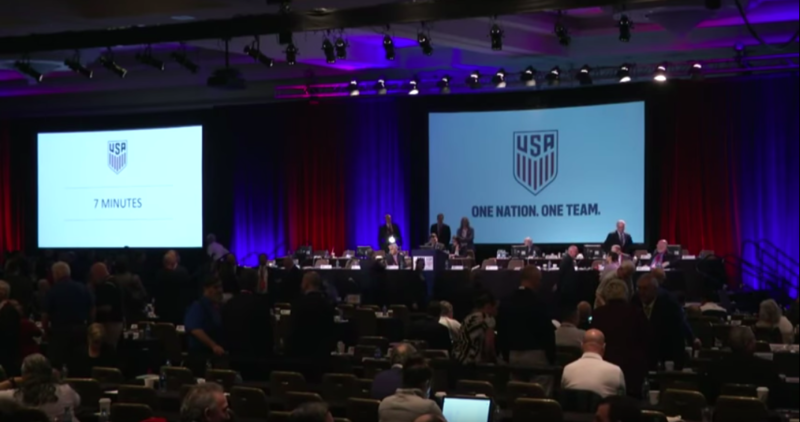 Leading up to the Federation’s Annual General Meeting, the U.S. Soccer Federation developed a comprehensive set of documents outlining the voting processes and rules set forth by the Federation for the upcoming election. In accordance with these guidelines, Vistacom’s Customer Success team set the ballot to reflect the U.S. Soccer Federation’s electoral system of weighted votes. In order to win, one of the eight candidates registered through Vistacom’s ballot system needed to receive 50 percent plus one vote. A Vistacom technician was present on-site at the Annual General Meeting to ensure the Presidential Election ran smoothly. Vistacom’s on-site technician managed each timed round of voting, displaying a countdown timer when appropriate. Orchestrating each round of voting required minimal attention from outgoing President Sunil Gulati and U.S.S.F. board members. “After this round if we do not have a winner, the bottom person will automatically drop out whether they wish to or not…off the screen,” said outgoing President Gulati. At the end of each round, the on-site meeting technician reported the number of eligible vote submissions to Plante Moran, an independent third party election process monitoring agency. Numerous steps were taken to test the accuracy of our balloting system and ensure the weighting was sound. Vistacom’s on-site technician worked with Plante Moran to both ensure the accuracy of each round of voting and display the voting results on screen. All in all, there were 507 voting delegates in the room and the 3 rounds captured the vote of 504, 504 and 505 delegates per each round, representing 99.75% of the eligible weighted vote. Vistacom’s audience response system (ARS) eliminated the time-consuming process of counting vote submissions, and updating each round of ballots. Vistacom’s Customer Success Team and on-site technician succeeded in honoring our commitment to delivering best-in-class customer service. Overall, the U.S. Soccer Federation’s Presidential Elections was made both more efficient and transparent. Join the Vistacom family today and experience firsthand why our customer retention rate stands at 95 percent. Schedule your free demo of Vistacom’s automated voting system and live audience response platform.